Automation Centre's Project Tracker Software simplifies your project portfolio management process, with access to files, resource plans, project financials, and management reports through the Web or in the email client already sitting on your desktop. Our software facilitates project portfolio management through solutions that return maximum results from your employees' time and efforts by streamlining workflow. These solutions provide tools for organizational and individual planning, scheduling, project financial management, on-line documentation, process control, team management, access to current status reports and more. Track the status and progress of projects. Track resource availability and workloads. By providing the ability to manage projects and their resources, measured against their status and estimated benefits, these solutions allow businesses to identify value projects and effectively budget and allocate resources. This PPM software helps organizations to prioritize projects effectively, ensuring that valuable projects have the time and resources they need to succeed, while projects of lesser benefit are re-scheduled or scaled back accordingly. Alignment of programs, projects and IT with the organization's goals and objectives. Efficient allocation of resources against workloads helps projects finish on time, within budget. Identification of troubled projects which can either be saved through increased resources, without unexpected impact on other projects and initiatives, or terminated to save costs. 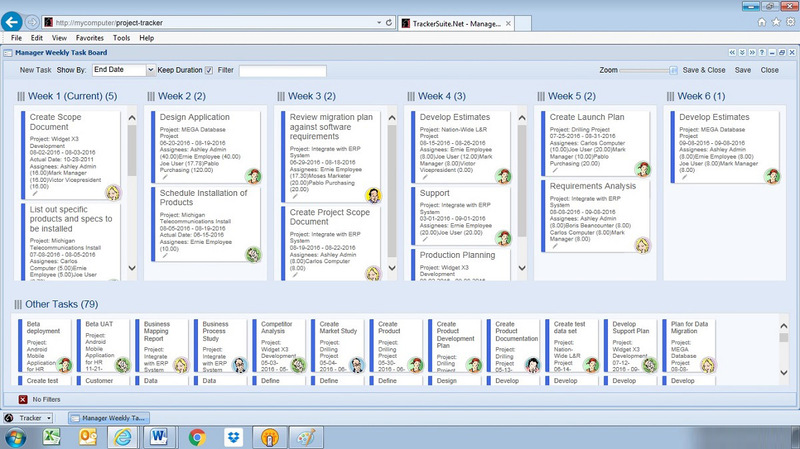 Project Tracker is a comprehensive project management system. It includes a project request and approval engine, with approval workflows based on project type and budget. Within a project, budgets, milestones, resource plans, status reports, project documents and emails, risks, and issues are stored and easily accessible. Project Tracker simplifies team creation with views of resource availability at the Week or Month level, with the ability to drill down on resources. Once the initiative is underway, the team can access a central project homepage to collaborate and report from any location. 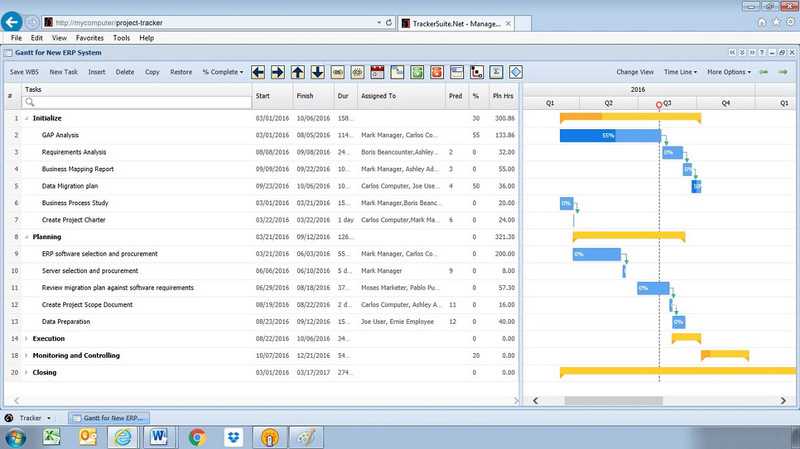 Project Tracker supports localization of projects, including dates and numbers. These home pages provide a central location for project documents, status reports, tasks and more. Project documents are protected with functions for check-in/check-out, versioning and approval workflow. Project Tracker also provides a function for document templates. Potential project risks can be profiled, with calculations of risk probability and impact. Resources can be assigned to risks to mitigate them. As the initiative proceeds, project stakeholders can monitor the status of risks, and leadership can utilize risk dashboards to assess the health of project portfolios. 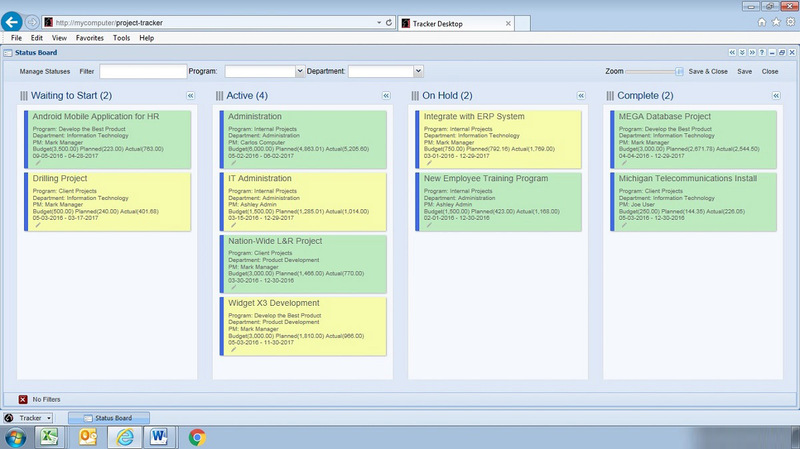 Managers can review the progress and status of projects at a glance with configurable Next Generation views, including color-coded project dashboards, as well as utilize reports including Milestone Grids, Gantt charts, Planned vs. Actual and Earned Value for All Projects. We have spent a few decades perfecting the art of software design and development. 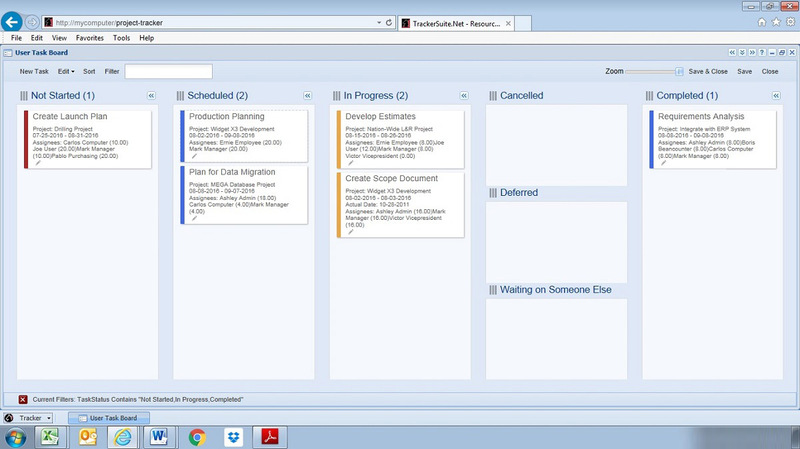 Here are a few examples of Project Tracker at work. A structured online project environment, with a hierarchy including project programs, definitions, milestones, budgets and billing, status reports, and Work Breakdown Structure (WBS). Bi-directional integration with MS Project. 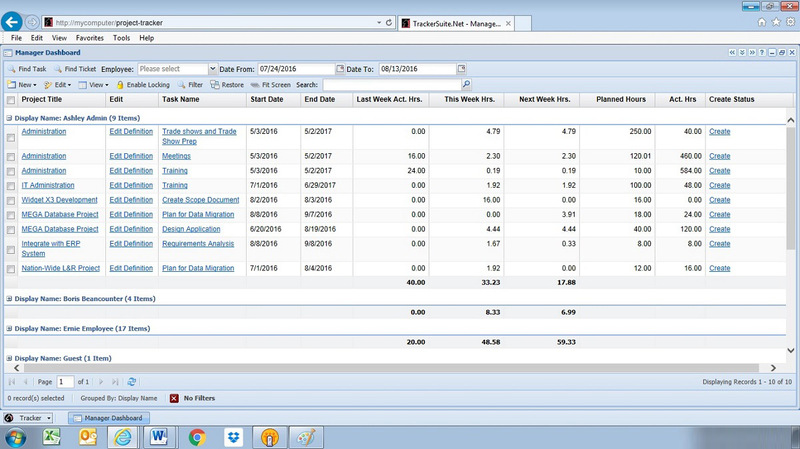 Review resource availability at the Week or Month level, with the ability to drill down on resources. Color coded Project and Portfolio Dashboards which can be emailed as on-the-fly status newsletters. 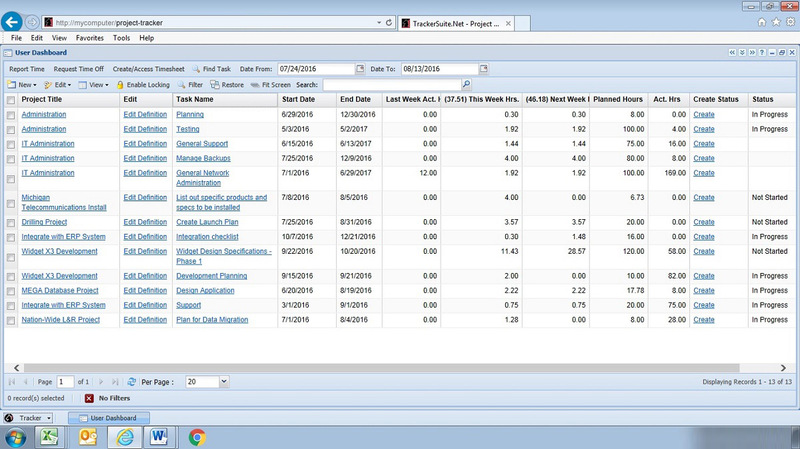 Task dashboards, lists and calendars that provide at-a-glance reviews of workloads, with single-click drilldown on task information and assigned resources. Automated notification of task assignments and schedule changes. Automated notification of status report due dates encourages timely reporting, which helps managers, sponsors and stakeholders stay abreast of the progress of their projects. Document management. Tracker solutions provide a central, online storage of documents and files, which users can access within their email client. 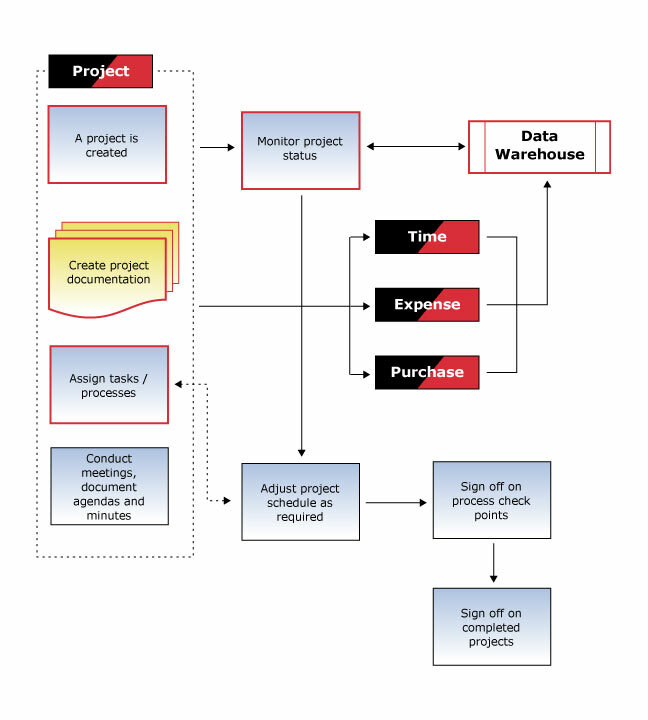 The ability to conform with PMBOK (Project Management Body of Knowledge) workflows. 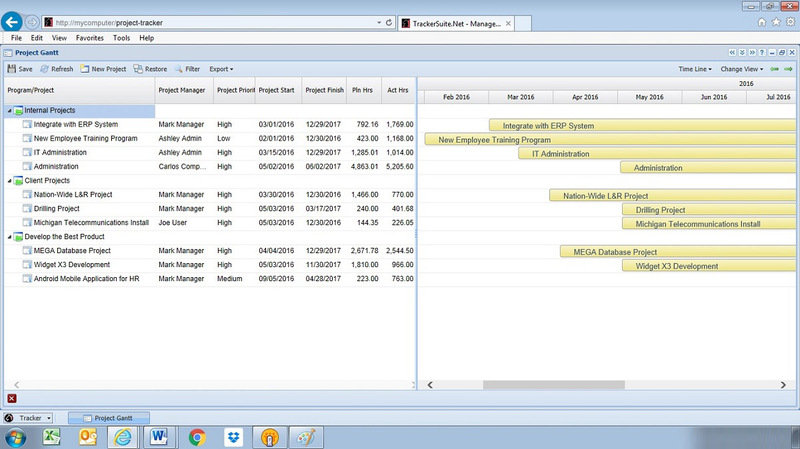 Project Tracker integrates with other Tracker Suite modules to facilitate other processes, including resource assignment and billing. Integrate with Personnel Tracker to simplify employee management and team building. Combine Project Tracker with Time Tracker and/or Expense Tracker and report time and expenses against projects over the Web, from any location. 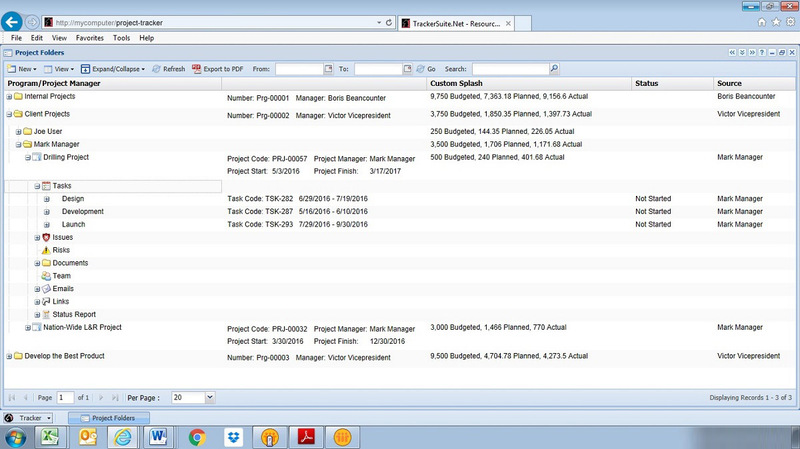 Or use Project Tracker in combination with Purchase Tracker to streamline and secure project procurement.